In a few weeks from now, I’ll be in Europe for the first time in 23 years. A tour of Italy in 10 days. I can’t wait! On the way home, I’ll be in Düsseldorf solo for 19 hours. My co-worker friend John suggested I should ready myself with German food. He lives by 2nd Ave., where the newly-opened Q train now runs. Right outside the 86th St. station, Heidelberg Restaurant, a New York institution for German cuisine since 1927, was our gastronomic paradise on Earth Day. Besides the butcher shop two doors down on the block of 86th and 2nd, it is the last remainders of the once vibrant German community on the Upper East Side. Food: Heidelberg’s meat dishes, butchered from Schaller & Weber, were amazing. It was a day of firsts: 1. Eating veal, and 2. Eating Sauer Braten, a tender beef dish. 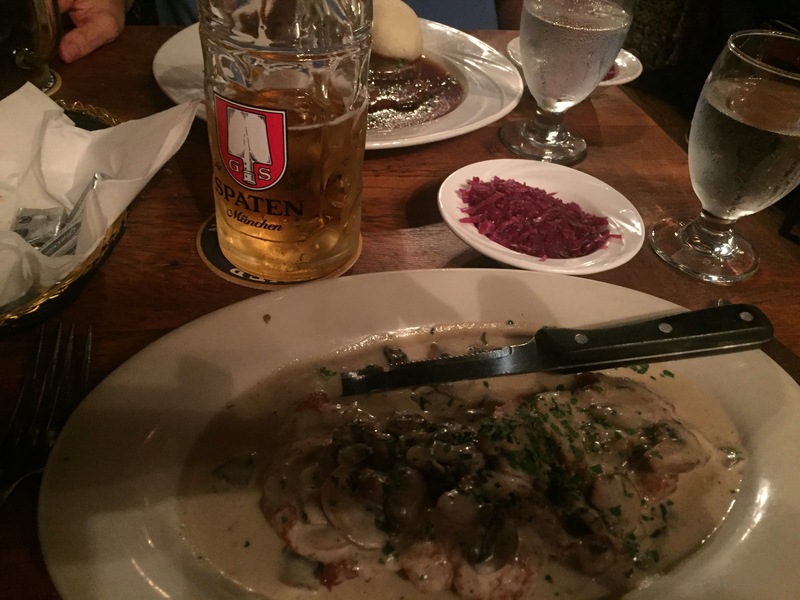 My veal dish was the Jaeger schnitzel = Schnitzel with mushroom cream sauce. The meat was pale and tender, with some heft to it, since it was once a calf who ate only milk. This is the main reason I’ve never tried veal before…and the mushrooms were wonderful! John’s Sauer Braten was the most tender, melt-in-your-mouth, goodness beef in a sweet-and-sour-type sauce that has a tinge of gingerbread essence. Even the grizzle was silky smooth. Yum! Both dishes were accompanied with red sauerkraut and spaetzle = German noodle-shaped dumplings. Spaetzle is light, and takes in the sauces beautifully. The sauerkraut was sweet and briny, and it matched well with the dishes. Dessert: Appel = Apple strudel, is flaky, heavy with cinnamon sugar, drizzled with caramel and the apples are baked slow and tender with nuts. It’s incredible. Yes, this is the German cure. And like the protesters who walked for Science on Saturday, we will walk together for a cause, see the world and try new things, thus broadening our own universal landscapes.